Patchwork farm views on Terceira​. Photo by David Schayne. Portugal is trending. Get ahead of the curve by traveling 800 miles off the Portuguese coast, to the otherworldly landscapes of the Azores. Popupla globetrotting contributor Ross Belfer penned an epic guide to the lesser-known islands of the archipelago. 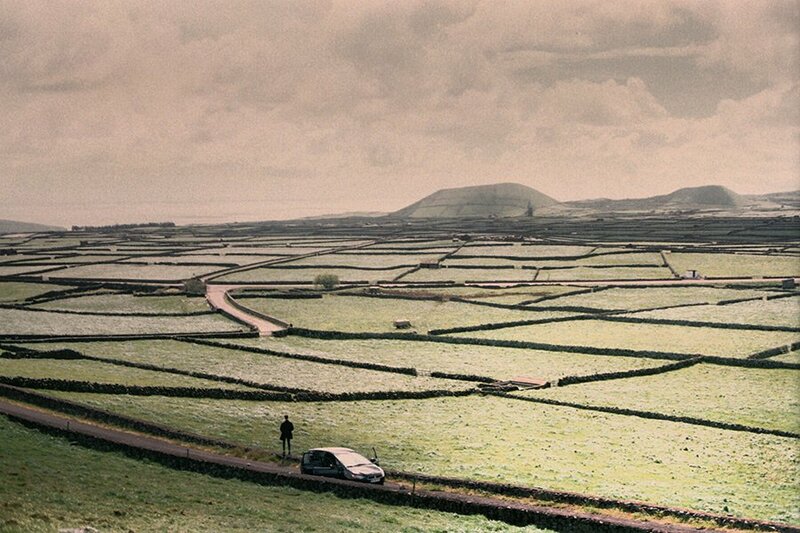 THE AZORES – It's been 395 days since I last touched ground in the Azores. The past winter was long and grueling, and nothing kept me trudging through the proverbial snow like memories of lush, otherworldly landscapes and the feelings of removal that come with being on a nine-island-chain in the middle of the Atlantic Ocean. 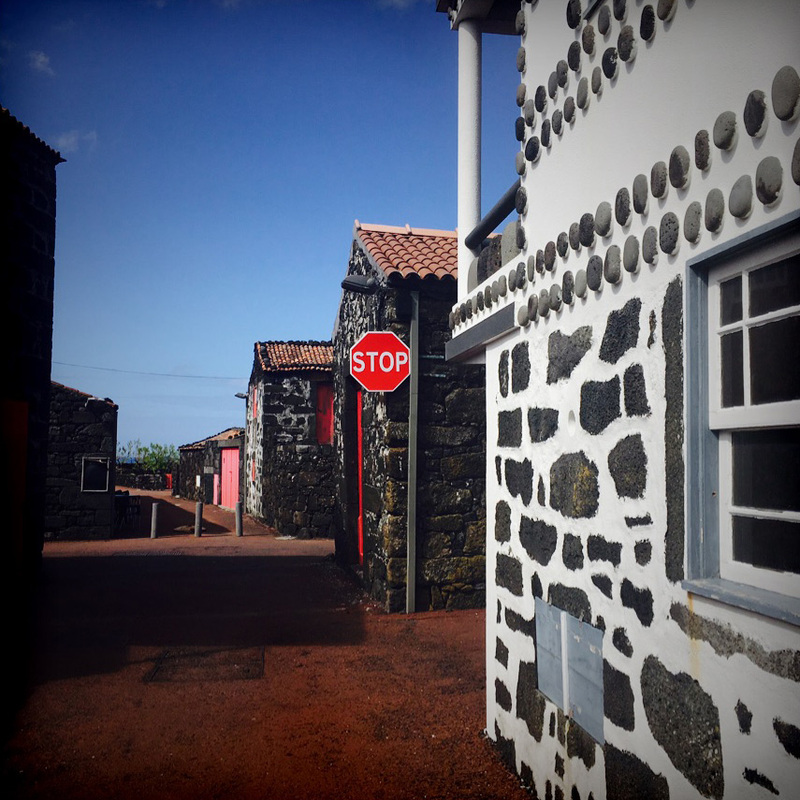 I arrived on Sao Miguel, the gateway to the archipelago, to liaise with a childhood friend, with whom I spent a few days exploring the enigmatic and lesser-trodden islands of Pico, Faial, and Terceira. With nothing more than a duffle of clothes and a backpack full of film, we documented the islands' surreal cultures, cuisines, and landscapes. The autonomous region of Portugal, located 850 miles from Lisbon in the north Atlantic, is ripe with volcanoes, algae-rich lakes, towering Japanese cedar forests, and what seems like more cows than people. Although one can swim during peak summer, surf some of the world's best waves year-round, walk serene black-sand beaches, and soak in geothermal pools, a trip to the Azores isn't a beach resort holiday. Coasts are lined with massive, rocky cliffs and fluctuate; the temperature fluctuates wildly. One can experience nearly every season of the year here in just one day, minus low temperatures and snow. 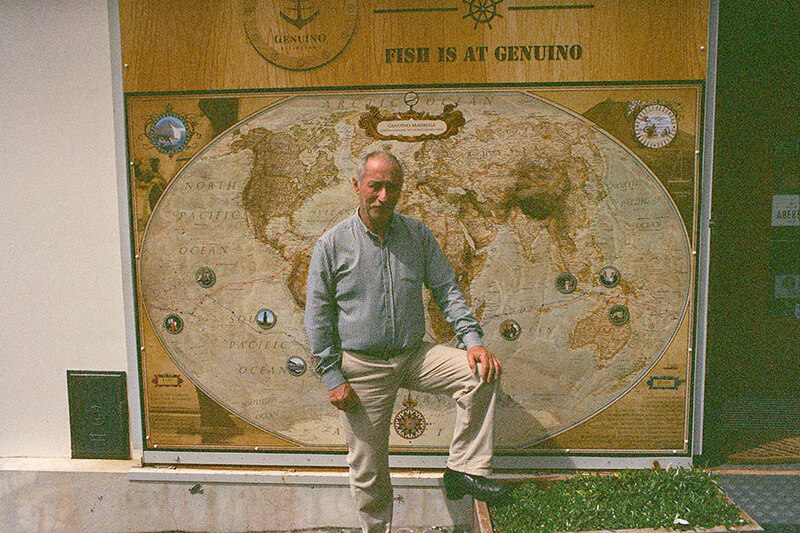 Genuino sailed lone expeditions across the globe, twice. Photo by Ross Belfer. 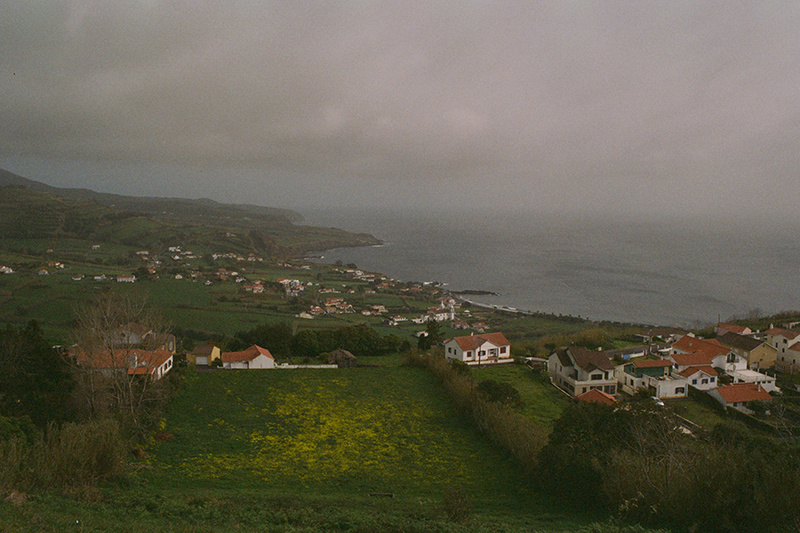 Brooding landscapes on Faial. Photo by Ross Belfer. Flying into Faial, the third most populous chain in the archipelago, is to be struck by its epic beauty. The island's main port, Horta, is charmingly European and lined with rows of faded houses. The neighboring black-sand beach, , is serenely set against lush green hills and small, terracotta-roofed chateaus. On the other side of Faial is the hypnagogic lighthouse , to which everyone on the island eventually gravitates. Our first stop was a meal at the famous , where the namesake owner and seafarer recounted tales of circumnavigating the globe twice without any crew or companions. This, of course, happened between generous bites of grilled albacore tuna (caught each morning by the man himself) and lapas (local limpet clams served with garlic in a hot skillet), which was washed down with volcanic wine from Pico island and finished with sweet potato pie. After a quick photo at Miradouro do Ribeiro Seco, one of 29 look-out points on Faial, we dashed across the island to the barren, charcoal-colored cliffside of Capelinhos, the site of the most recent Azorean volcanic eruption, which prompted a mass wave of emigration to the U.S. in the 1950s. The volcano sits on a cliff that jettisons into the Atlantic, an odd growth in an otherwise flat and salty landscape. A multimedia exhibition in , designed by Portuguese architect Nuno Ribeiro Lopes, explains the geology and history of the volcano under which we stood. Though mesmerized by the low-bit, Vaporwave-inspired graphics, we cut our stay short to catch the ferry from Horta to Madalena on Pico. We noted and for next time, dropped our rental at the ferry dock, and waved farewell to Faial. The vintner village of Lajido. Photo by Ross Belfer. An American stop sign found in Lajido. Photo by Ross Belfer. Given its location in the mid-Atlantic, Pico is well-known for whale-watching expeditions. We took an early-morning, three-hour cruise on a ten-seat raft with and caught a glimpse of a ten-foot blue whale tail. Views of the island were superb, though (for beginner seafarers) there were definitely easier ways to marvel at Pico. Take, for example, heading up to the godly , which towers over the island unlike anything I had ever seen. Driving through clouds on winding dirt roads to its visitors center, , was like ascending to heaven, if heaven was the highest point in Portugal, at 7,710 feet. It was just what I needed to get my head out of the digital world. Once hunger set in, we settled into Restaurante Marisqueira Ancoradouro (Estrada Longitudinal, Areia Larga, Madalena; +351-292-623-490) an airy and new seaside restaurant by an autodidactic restauranteur named Pavel, a former commodities trader from Moscow. The remarkable meal was prepared only with ingredients sourced from the island and consisted of a salad of strawberries and greens, grilled octopus with sweet potato puree, honey pudding, and other contemporary takes on Azorean cuisine, as well as a few bottles of Curral Atlantis wine — salty, dry, and much lauded on Pico. The highlight of our stay on Pico was visiting the 15th-century coastal vintner village of Lajido. The place resembles a ghost town on Mars, where landmark stone houses painted in white, red, and brown stand in surreal contrast to the rust-colored roads and brooding blue of the Atlantic. When we visited, there were no residents in sight — not on the small streets, not in the two-story homes flanking them. What we did see was lava giving way to swirling, thermal ocean water by the rock formations at Cachorro. Both experiences were done on foot, slowly, as if time stood still. Unfortunately, time did not stand stand still. 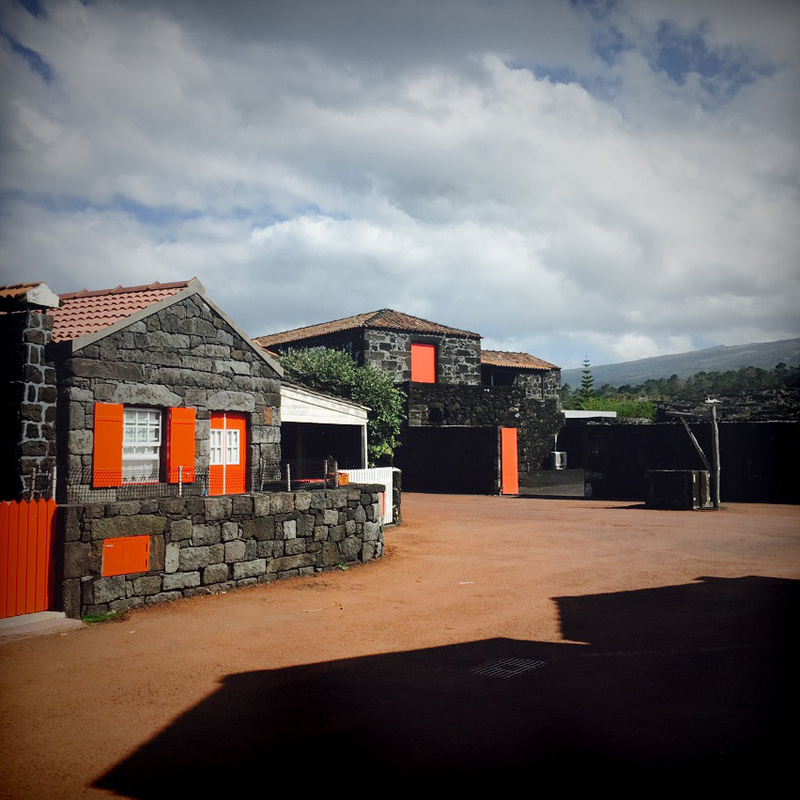 We weren't able to visit the lava cave at , Pico Wine Museum, the parish of Santa Luzia, or , run by Canadian-Azorean cultural impresario Terry Costa, which puts on homegrown music festivals and art fairs on the island throughout the year. To put it plainly: One day certainly wasn't enough time on Pico. Angra do Heroísmo. Photo by Ross Belfer. The vintage market in Angra do Heroísmo. Photo by Ross Belfer. Algar do Carvão. Photo by David Schayne. The second-most inhabited island in the Azores is considered among the least beautiful by locals, but I found that easy to argue. Angra do Heroísmo, the island's largest town, is clad in picturesque Spanish-style architecture, evoking idyllic seaside charm. Its clandestine food and vintage market, Duque de Braganca Market (Rua do Mercado; +351-295-401-700), is worth visiting, especially for the snacking opportunities throughout. This is the kind of town where one can easily spend hours on the streets photographing weathered faces. Or inside the 16th-century Sé Catedral do Santíssimo Salvado (Rua da Sé; +351-295-217-850) marveling at post-Manueline architectural stylings. 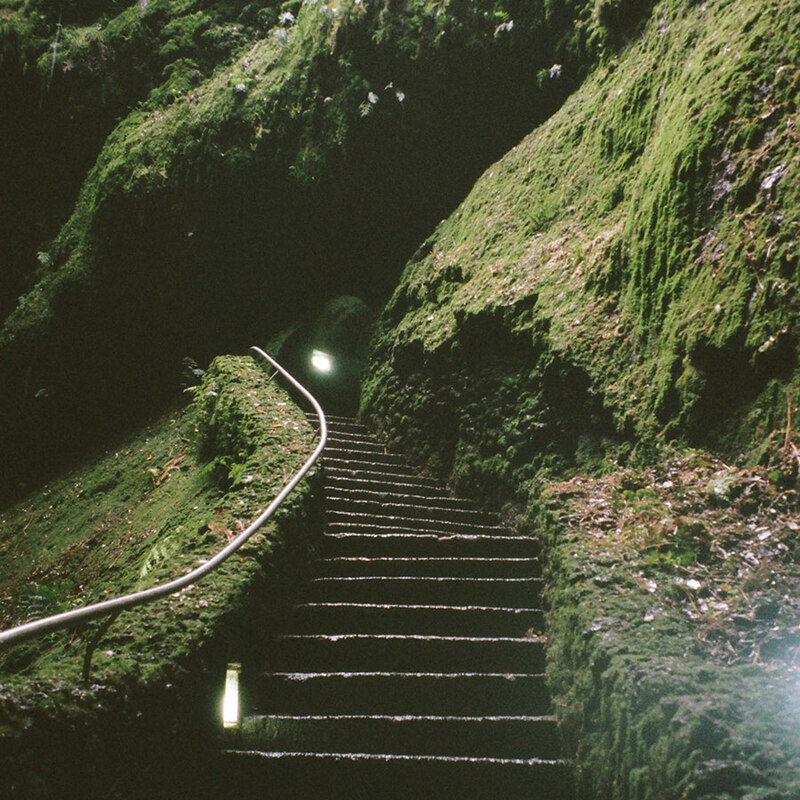 Leaving the city, all signs led to (cavern of coal), an ancient lava tube that leads into a volcano that last erupted 3,200 years ago. We descended through the tube, covered in spectacular colored rock formations known as silicate stalactites, to the bottom of the cave, where a clear water pool shined bright from the sun reflected off its surface. Terceira had proven itself worthy before a single meal was eaten, but that didn't stop us from seeking out local cooking, which differs from the cuisine of neighboring islands in its emphasis on spices, particularly saffron and paprika. 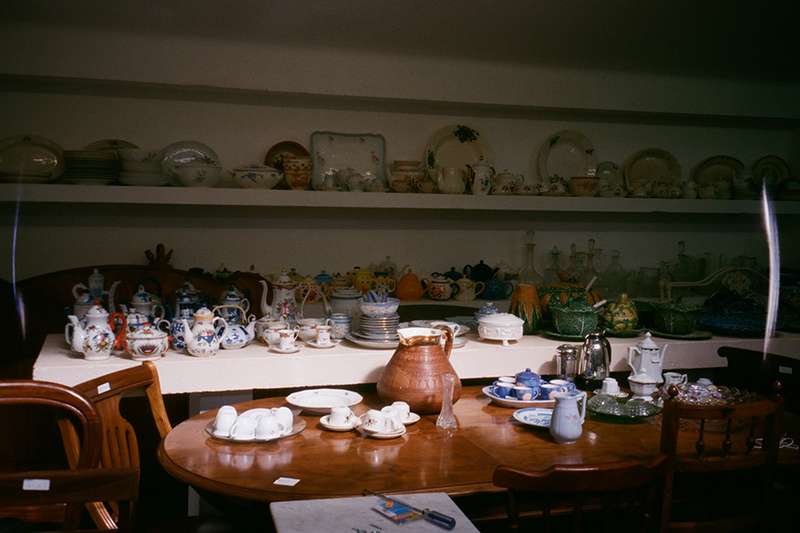 (Terceira is a long-time trading post.) And so we found ourselves at , a hotel, farm, and restaurant outside Angra dedicated to giving visitors the experience of living on Terceria as locals did in the early 1900s. The meal at the property's restaurant was organic and farm-to-table in the truest sense — seasoned olives, rich red wine, vegetable soup with mint, grilled fish, and glacially-slow-cooked beef rump that literally shredded itself off the bone, all sourced from the farm or locally on the island. It was fitting that our final stroll through Terceira was a walk through Praia da Vitória, a small port on the eastern coast of the island. Founded around 1456 as Vila da Praia, the town has a pleasant harbor, , the town's staple cultural center, and the iconic Igreja Matriz de Santa Cruz church (Ladeira de São Francisco; no phone) with its Gothic facade. Limpets from , a local favorite with affable staff and an impressive wine collection, was a welcome final taste of the island. 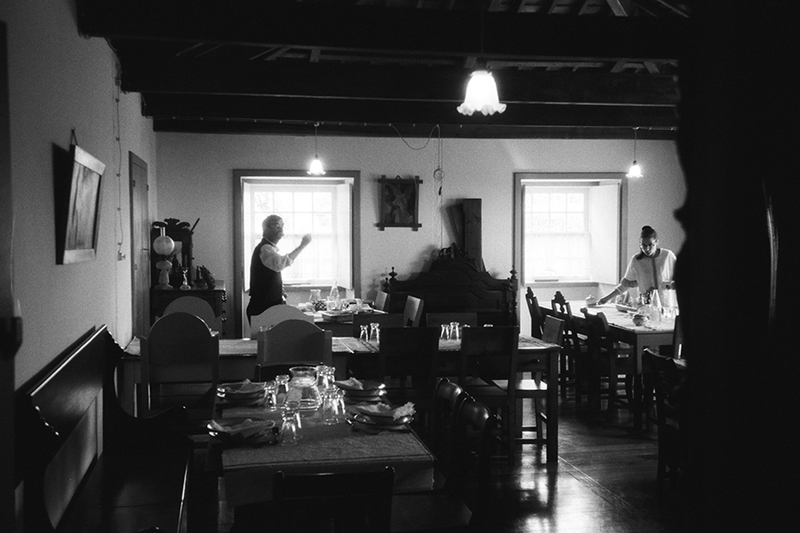 The restaurant at Quinta do Martelo. Photo by Ross Belfer. My first night in Sao Miguel was well spent at the island's sole Design Hotels member, located across Ponta Delgada marina. The hotel has h rooms with remarkably comfortable beds and a rooftop bar serving a tasty array of dishes and cocktails made with local GoShawk Gin. The multi-generation tea farm and rustic-chic family home of architect and renaissance man Bernardo Brito e Abreu houses eight-private villas on a stunning property that looks like something out of a fairytale. Throughout the year, Pico do Refugio commissions acclaimed multidisciplinary artists from around the world (most recently, the London-based Graham Gussin; last year, it was Sonic Youth frontman Thurston Moore) for one-month residency programs in an environment of creativity, reclusiveness, and untainted nature. Roosters may roost at sunrise, but time spent at here has yielded some of the most beautiful moments of my life. One of the most original hospitality experiences on the planet, this Art Deco edifice sits on the majestic Terra Nostra garden, which was originally built and designed in the 1920's at the home of the honorary U.S. Consul to Sao Miguel. It turns out said Consul was bequeathed prime real estate: The volcanic terrain gives way to geothermal pools rich with iron, zinc, and other essential minerals that seep into your body during a soak among verdant horticulture from more than five continents. Don't forget to square away a table at the hotel's high-end restaurant — order the Chiado, a pot puree of meats cooked in an iron casket for eighteen hours by, you guessed it, the geothermal pools buried below. We spent two solid nights sleeping in the no-frills volcanic stone suite at this lovely property on the southern coast. Don't expect much from breakfast. Do expect a roach or other unsavory insects to enter your room, but don't be alarmed, it is simply part of the charm. If affable service and basic accommodations on lovely grounds with winding paths that lead down to the roaring Atlantic sound good, then this place is for you. Nostalgic vibes transport you to the past, while meals of delicious root vegetable soup and Azorean slow-cooked beef fortify explorations of hotel oddities — like an old barbershop, chicken coup, and sculpture garden. Guest houses offer zeitgeist decor. It's a no-frills stay worth experiencing. My final hotel stay sadly turned out to be the worst. What this property lacks in proper breakfast (is anything here fresh or seasonal? ), access to the indoor pool (through a strange corridor that resembles a bedroom hallway), and noise (is it necessary to renovate the room above ours at 7 a.m.? ), it compensates for with stunning views of the ocean, Fanal Bay, and Mount Brazil. It also overlooks a 16th-century fortress. 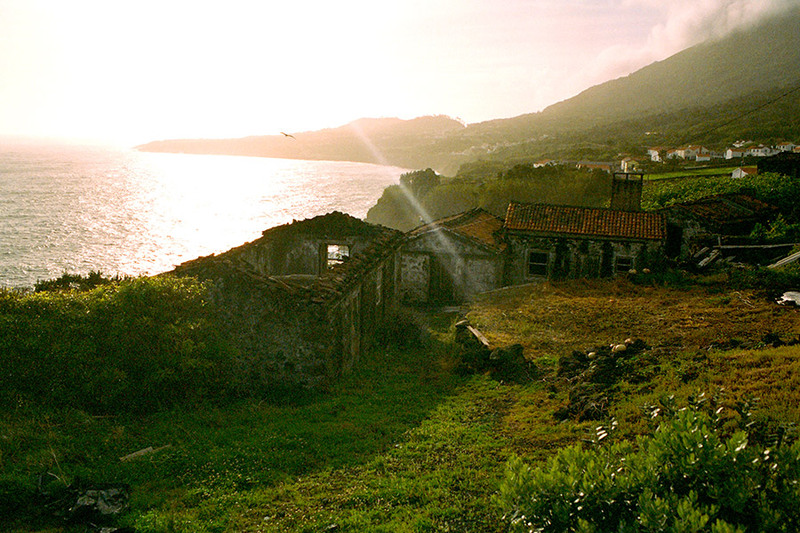 Dilapidated domiciles at golden hour on Pico island. Photo by Ross Belfer. Flying into Sao Miguel, two hours from Lisbon or four hours from Boston on Azores Airlines's new, low-cost routes. From there, it's a quick flight to any of the other islands. Rent a car. Public transport is sparse or non-existent and taxis are pricey. at the airport has Smart Cars, which are perfect for zipping through the clouds when you're a party of two. Beat the summer crowds and visit in April or May when temperatures are moderate, or in September and October, while remnants of the summer sun still linger on the Atlantic. Smile and say thanks. 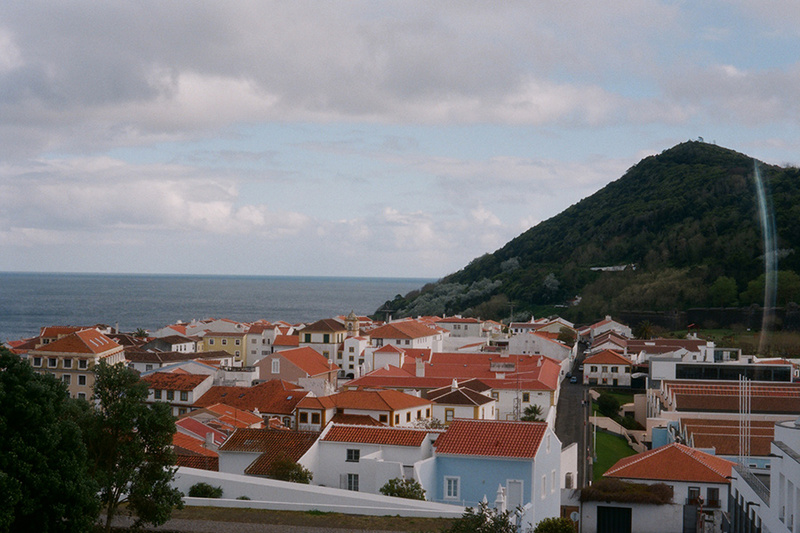 Azorean people have long shared a familial connection to the States. Colloquial English is a often common thread, but don't be afraid to pick up Portuguese along the way. An obrigado will be greatly appreciated. Был найден мной полезный портал , он рассказывает про seotexts.com.